Learn how to email messages and docs directly from a Pipeline transaction to internal and external recipients. Enter a subject. If you leave this field blank, Pipeline will automatically use the transaction name as the subject. If you type something here, the transaction name will automatically be appended to it. Type in or select your recipients. 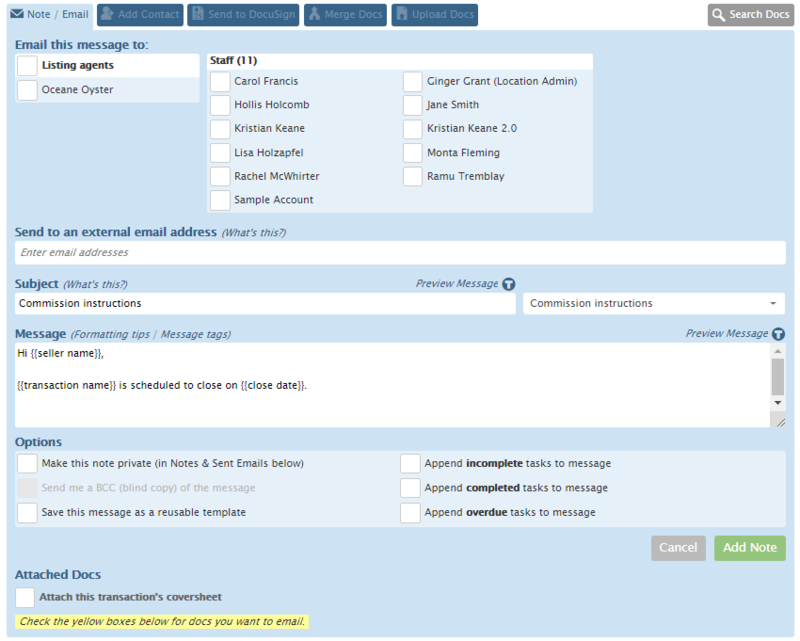 Alternatively, drag and drop email addresses of contacts (including outside co-op agents) into the external recipients box. Select any additional desired options (described below), then click [Add Note] or [Send Email]. Note vs. Email: To add a note to a transaction without sending it to anyone, don't specify a recipient. Your note will be added to the "Notes & Sent Emails" section at the bottom of the transaction without being sent to anyone. Select from additional choices in the Options section. Each option is described below. Click [Make this note private (in Notes & Sent Emails below)] to make a note visible only to the note sender, internal recipients, and admins. Uncheck the option to make the note visible to anyone who can see the transaction. Click [Send me a BCC (blind copy) of the message]. Click [Save this message as a reusable template]. This Pipeline Pro session covers multiple ways to streamline the process of emailing from Pipeline. We'll cover features and strategies to execute before and after the send. In this Pipeline Pro session, learn the various ways to type less, optimize more, and make your messages do all the work!